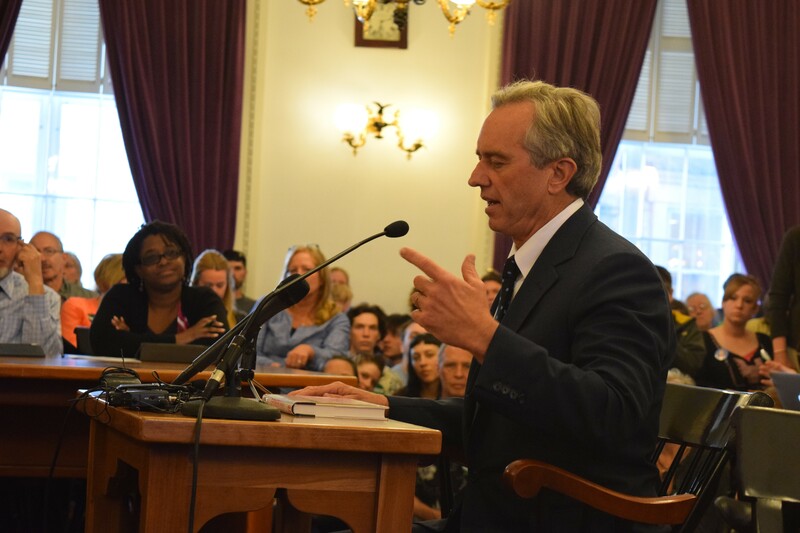 Robert Kennedy Jr. testifies Tuesday at the Vermont Statehouse. Rep. Alice Miller was exuberant Tuesday afternoon. She’d just had her picture taken with Robert F. Kennedy Jr. as he passed through the Statehouse. 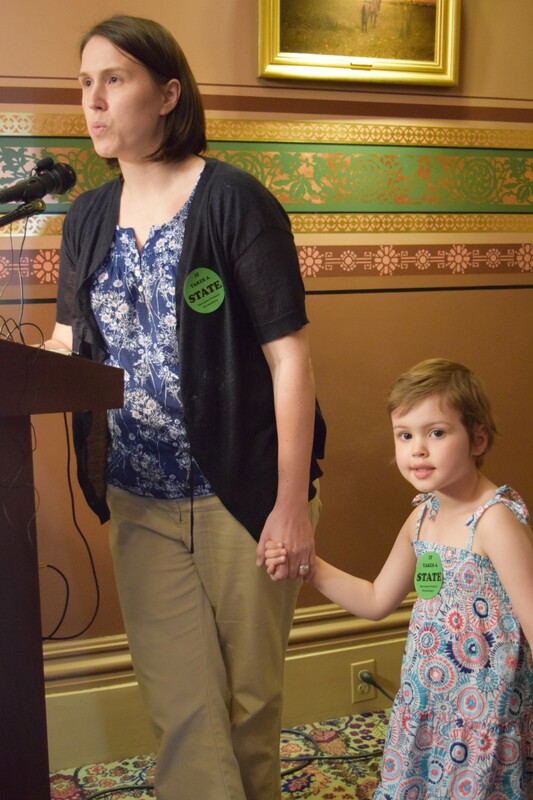 Mia Hockett, a Burlington doctor and mother, talks Tuesday at the Statehouse about the need for vaccinations. Her 4-year-old daughter, Merin, has leukemia, which compromises her immune system. Many in the Statehouse were similarly star-struck Tuesday as the son of the late presidential candidate and nephew of the former president flew to Vermont for the afternoon. He was here to argue against removing a philosophical exemption that allows parents to skip vaccinations for their children. And the Kennedy mystique set him apart from others testifying before legislators. Kennedy got an audience with Gov. Peter Shumlin and House Speaker Shap Smith. And he got the first slot to testify before the House Health Care Committee, which waited while he was a few minutes late. His message: Don’t take vaccination decisions away from parents, because the federal government cannot be trusted to regulate the pharmaceutical industry. “The only thing left that protects that child from that company — the only barrier standing — is the parent and now they want to take the parent away,” Kennedy told the House Health Care Committee. He has worked on the issue for 11 years, but his work has has been widely questioned. His main focus has been on thimerosal, a mercury-containing compound that has already been removed or greatly reduced in childhood vaccines. Kennedy was invited to Vermont by the Vermont Coalition of Vaccine Choice, which hopes to keep the House from removing the philosophical exemption. The Senate has already voted for removing the exemption. It’s unclear whether the House will vote on the highly charged issue this year. Three years ago, the House declined to do so, but sentiment on the issue has shifted toward mandatory vaccinations following measles outbreaks in California and Massachusetts. Mia Hockett, a Burlington doctor and mother, strongly urged House members to follow the Senate in removing the exemption. But Hockett struggled to get the attention Tuesday that Kennedy seemed to get just because he’s a Kennedy. Hockett said she felt compelled to speak up for removing the state’s philosophical exemption when she realized others didn't seem to understand the dangers unvaccinated children create for those with immune deficiencies. “I want to be able to give that personal story,” she said. 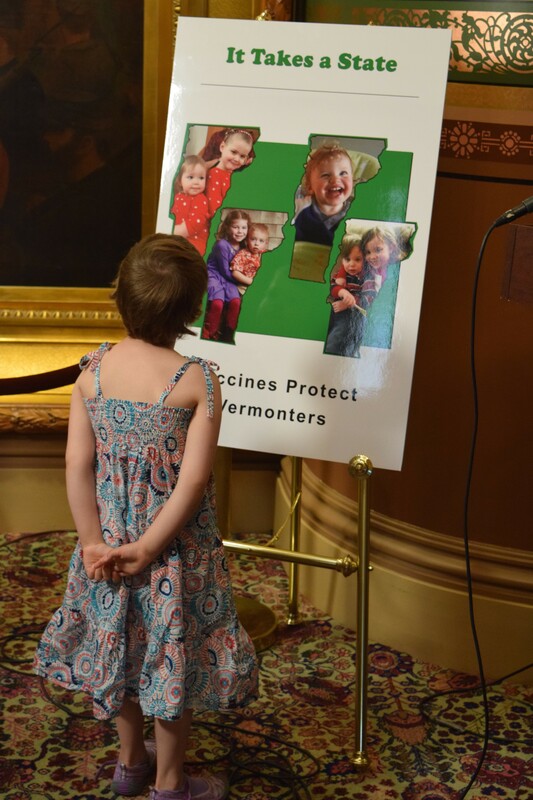 Mia Hockett's daughter, Merin, looks at a poster that a group of Vermont mothers, including hers, put together to emphasize the importance of immunizations. rin couldn’t go to pre-school, to the library or other public settings where she could be exposed to illness, her mother said. With Merin starting kindergarten next fall, her parents scoured immunization rates at Burlington’s elementary schools, and were disturbed to find rates in the 80 percent range. A low rate at the Integrated Arts Academy put that school off limits, so the family chose Champlain Elementary. “She has a right to go to school,” her mother said. Hockett also testified before the House Health Care Committee on Tuesday after Kennedy swooped in and out, followed by cameras. Dorian Yates of Strafford, a member of the Vermont Coalition of Vaccine Choice, said her group paid for Kennedy's trip to Vermont. The group held a reception for Kennedy in the Statehouse cafeteria, where legislators and others milled around, snapping photos and sharing stories about Kennedy connections. Rep. Miller said that despite her Kennedy fascination, she would be unswayed by his arguments. She planned to support removal of the philosophical exemption if the measure reaches the House floor.